The ear-acupuncture treats all the various illnesses which medical principles is the well known, but selecting the pint is the important condition for obtaining the good effects. It helps cure hypertension, heart disease, gastroenteritis, dizziness, tinnitus, insomnia, headache, kidney stone, etc. Wearing Aura Energy Stone will increase the flexibility, enhance strength, improve the sense of equilibrium and boost vitality to the whole body. 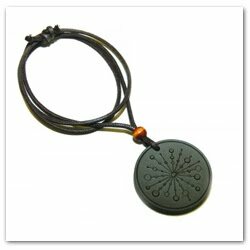 It is a Stone produced uniquely from Korean Mineral Science Technology to provide us with sufficient SCALAR ENERGY, which enriches our Bio-energy field with negative ions. 13. Activates Water Molecule in order to increase the body oxygen level and improve blood circulation. 14. Improves stamina and body balance. Music therapy is an allied health profession and a field of scientific research which studies correlations between the process of clinical therapy and biomusicology, musical acoustics, music theory, psychoacoustics and comparative musicology. It is an interpersonal process in which a trained music therapist uses music and all of its facets—physical, emotional, mental, social, aesthetic, and spiritual—to help clients to improve or maintain their health. Music therapists primarily help clients improve their observable level of functioning and self-reported quality of life in various domains (e.g., cognitive functioning, motor skills, emotional and affective development, behavior and social skills) by using music experiences (e.g., singing, songwriting, listening to and discussing music, moving to music) to achieve measurable treatment goals and objectives. Referrals to music therapy services may be made by a treating physician or an interdisciplinary team consisting of clinicians such as physicians, psychologists, physical therapists, and occupational therapists. Music therapists are found in nearly every area of the helping professions. Some commonly found practices include developmental work (communication, motor skills, etc.) with individuals with special needs, songwriting and listening in reminiscence/orientation work with the elderly, processing and relaxation work, and rhythmic entrainment for physical rehabilitation in stroke victims. Cupping therapy is the method of using glass or plastic cups to create localized pressure by a vacuum. The Chinese have been doing this since ancient times by using heat inside glass or bamboo cups. Nowadays, cupping sets use suction to create the vacuum. The vacuum inside the cups causes the blood to form in the area and help the healing in that area. Ancient Chinese medicine have believed that the body contains "Meridians". These meridians are pathways in the body which the energy of life called Qi ("chi") flows through. It flows through every body part, tissue, and organ. Cupping therapy is mainly performed on one's back because there are five meridians on your back. When these meridians are opened, the internal energy is able to flow through the whole body. Another healing aspect of cupping therapy is through the release of toxins in your body. The suction from the cups can penetrate deep into your tissues causing the tissues to release harmful toxins. It triggers the lymphatic system, clears the blood vessels, and stretches and activates the skin. Cupping therapy has been found in ancient records dating back 3500 years and it is still used today by many alternative medicine practictioners. New advancements in technology and materials have been integrated with cupping therapies and its uses now range for many different treatments and applications.